"The Brothers' Reserve line gives founders and brothers Kurt and Rob Widmer a chance to play with new styles and premium ingredients, showcasing their talent for innovation and honoring their creative passion for craft brewing. The goal is to offer high-end craft beer fans unique, one-of-a-kind brews that are truly limited in nature. These offering are for enthusiastic beer lovers, personally crafted by two of the most enthusiastic beer lovers around. 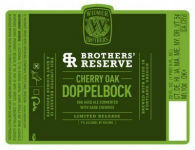 The Cherry Oak Doppelbock pours a medium reddish-brown that produces a healthy tan colored fizzy head. Body clarity is hazy and has a brilliant red glow. Head has decent retention and leaves a minimal amount of lacing on the glass, and has now thinned out to a very wispy residue. After popping the cap on the 22 oz bottle, a light aroma of raisins and dates filled the air. Additionally, a fair amount of fruit (cherry) along with a rich woody flavors were detected. A sweet (sugary) malt aroma dominanted, without a noticable hop presence. A fair amount of alcohol was noticed- almost burning, but not scathing. The first impression is how rich the beer is. Initial taste is full of dense malts with some chocolate sweetness and a hint of the alcohol presence, moving to a finish with some dark cherry-laden tartness. Medium in body and softy carbonated, the Cherry Oak Doppelbock washed down easy - almost too easy. Our palates were left quite slick, leaving an oily film on our tongue and lips. The 9% alcohol was noticable, warming us from the inside, but not burning in our mouths. First and overall impression is that this is a warming, dense beer with a really nice slick coating. The malt richness is very enjoyable and does well to mask the alcohol levels up front. However, the alcohol presence was quite dominant in the finish. We recommend picking up at least two bottles. Try one today and then one in a year from now. Take notes. We believe that the alcohol will mellow out and the woody cask flavors will become more dominant. Reviewed on October 26th, 2009.